The purpose of this SEMRush review is to provide an answer to those looking for a digital marketing tool but don’t know which one to choose. It is also for those who want to know if SEMRUSH is the right tool to invest their time and money. Those that read my posts on a regular basis know that I rarely do reviews or suggest a product or service. This is because I don’t want to influence my readers into buying a product or subscribe to a service they don’t really need. This is not the case with SEMRUSH. I have been using it for a couple of years now and I truly believe that it is the tool you need. It is a complete platform with many toolkits to help you improve your SEO, optimize your PPC campaigns (including shopping campaigns), spy on our competitors, analyze your content, monitor brand mentions, build links and many more useful functions. In general, SEMRUSH can carry out all the tasks a modern digital marketer has to do, in a professional manner. How to choose a SEM (Search Engine Marketing) tool? Over the last 18 years I had the opportunity to work with a number of tools. It is part of my job as a Digital marketing manager to know what tools are available in the market that can help me make my job easier, faster and more efficient. When I say ‘a number of tools’, I literally mean a lot of tools. Don’t get my wrong, I did not work with ALL the digital marketing tools available, but I have seen and used a number of them so as to have the confidence to comment on what is good and bad (not so good) for my job. Before getting into SEMRush and explain why I believe it is one of the must have tools for everyone into digital marketing, let me quickly outline the criteria I use for selecting and using a tool. This is first in my list since if a tool is not really useful for me (no matter cheap or expensive) its a waste of time (and money) to buy it. By useful I mean to give me the data and metrics that either are not available otherwise or is too time consuming to gather manually. If you are not careful where you spend your money, you may end up paying a few hundreds of dollars per month on subscriptions you don’t really need. Or on tools you could pay less, if you did a better research. I don’t have a problem subscribing to tools (there are some essential tools you cannot live without) but as mentioned above, they have to be useful. This is related to usefulness but it in a different way. I am always looking for tools that have a number features and not only do a specific thing. 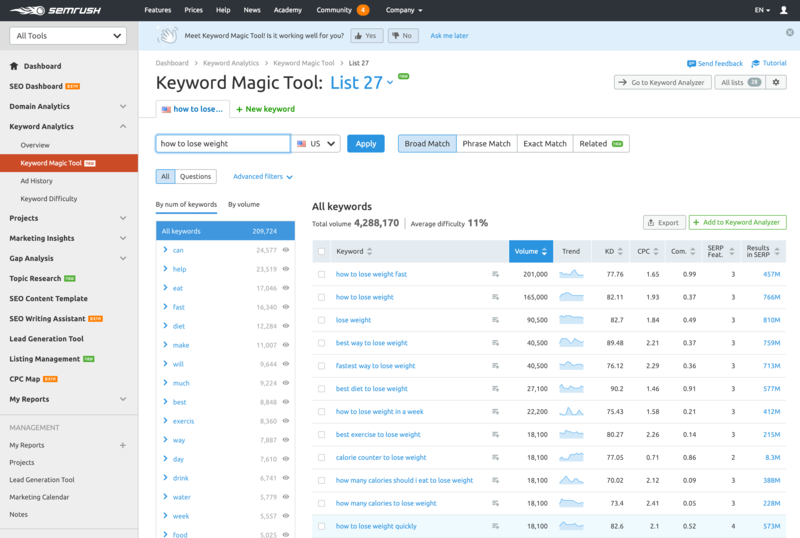 For example with SEMRUSH, you can do tasks related to SEO, keyword research, rank tracking, social media, link building and PPC, all within the same tool. How many times have you downloaded or subscribed to a tool that is advertised to do a lot of things but it was so hard to use that you had to spend hours learning how to do the basics? That’s really a waste of time and money. Tools for digital marketers should be easy to use and intuitive. Last but not least, you expect from a tool to give you reliable and up-to-date data to help you make decisions about your campaigns that are based on real facts. How SEMRush can help you become a better Digital Marketer? SEMRUSH is not a tool but a complete platform for performing the a number of tasks including: keyword research, keyword tracking, site audits, backlinks audit and analysis, advertising research for your PPC campaigns (including shopping campaigns, video advertising and display advertising), domain vs domain comparison, social media analysis, keyword difficulty analysis and many more. The figure below is an overview of SEMRUSH features. The pro subscription is $99.95 (monthly) which gives you access to the features mentioned above. This is a reasonable price if you take into account that other tools charge this amount per month for only keyword tracking or for only keyword research and backlinks analysis, without giving you all the other useful features. If you sign up for the annual plan, the monthly subscription goes down to $83 per month which is even better. They team behind the tool, did a really good job with the interface. Everything is set up in a clear manner allowing you to work on your projects without getting lost into unnecessary options or menus. Data is up-to-date and includes info about all types of websites and not only the popular ones. In addition, they have good documentation (including webinars and academy) and a very informative digital marketing blog. To get a better idea on how SEMRUSH can help you, I will give you some examples on how you can practically use it when working with your websites or your clients projects. The first step if you want to replicate my examples is to register for a 7-Day Free Trial. This will give you access to the tool and all features. They don’t require a credit card to register (this is something I hate in other tools) and once you are happy with your trial you can simply upgrade to pro, guru or business. Let’s assume that you want to do research for one of the most popular niches on the web, the weight loss niche and find article topics that are easy to target but yet worth it i.e. long tail keywords. 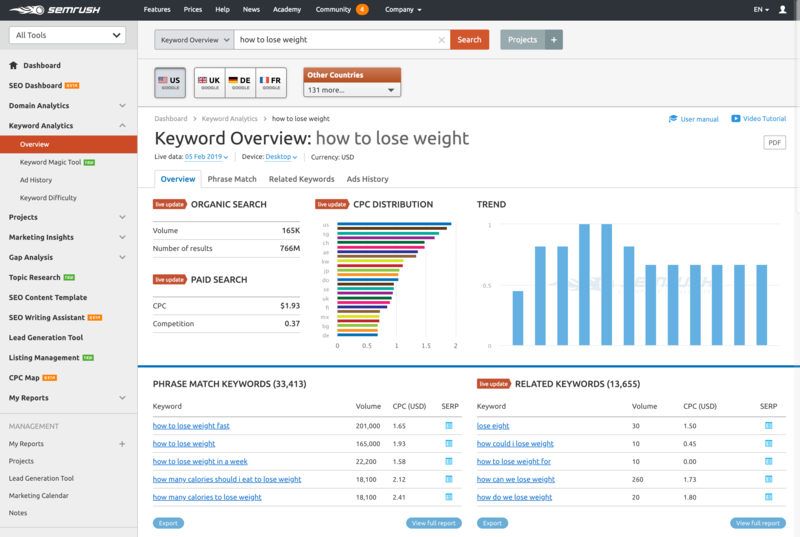 Login to SEMRUSH and enter the keyword ‘how to lose weight’ in the top search bar, select US traffic and click the Search button. What you see now in your dashboard is almost everything you need to know about the keyword ‘how to lose weight’ in summary form. You can see the general volume for this keyword, related keywords, CPC information, websites ranking for the keyword, PPC ads currently running (including the actual ad copy) and many more. Since our goal is to find long-tail keywords, click the “View Full Report” button below the ‘Phrase Match Keywords’. If you are still on the trial version you can see 10 results only but you can already spot the first candidate long tail keyword ‘how many calories should i eat to lose weight’. On my pro version I can do further digging and find other keywords that have even more words like ‘how much water should you drink to lose weight’. Clicking on the keyword will give even you more related keywords. The experienced eye can spot that the keyword ‘how much water to lose weight fast’ is a better candidate but let’s check the facts. Semrush gives a percentage difficulty for each keyword and you can see that the keyword ‘how much water to lose weight fast’ is indeed easier to target than ‘how to lose weight’ or ‘how much water to lose weight’. I am sure that most of you will agree that one of the most time consuming tasks of SEO is the backlink analysis. How many backlinks do you need to improve your google rankings and how does your link profile compares with your competitors? Well, SEMRUSH has the answer for you. Under ‘Backlinks’ from the left menu there are a number of tools you can use to find link opportunities. 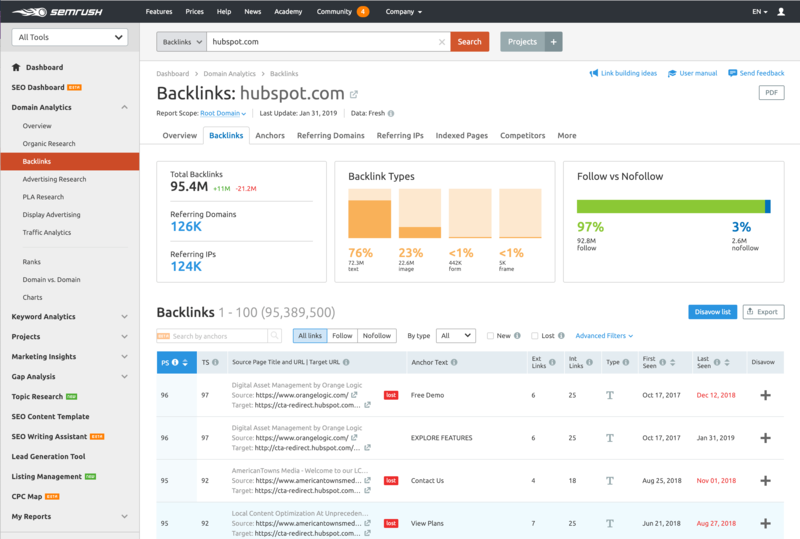 Let’s assume that you work for reliablesoft.net and want to find new link opportunities, you identify that hubspot.com is a similar (but stronger) blog and want to analyze their link profile. When was the link added and many more info. To make this easier to analyze, you can use filters and exclude anchor text that contains their domain i.e hubspot, and known blogs like problogger.net and quicksprout.com (they are hard to get). So, you end up with a smaller list of blogs that link to hubspot which can potentially link to your blog (remember you work for reliablesoft.net), if you contact them or otherwise (connect with them in social media) and let them known that you exist. One of the most important metrics when trying to rank a website in Google is your ranking position for different keywords. All SEO experts know that you are not going to magically appear in the first page of Google for your target keywords, but you need to gradually work your way up. SEMRUSH has a feature for this and it is called ‘Position Tracking’ – it can be found under Tools from the left menu. The pro version of SEMRUSH allows to add up to 500 keywords and monitor their position in the Google organic results or Adwords. This is pretty cool since most other tools either charge more for the position tracking feature, allow for less keywords, don’t track Adwords positions and they don’t give you all the other functionality SEMRUSH offers, at the same price. The use of this feature is simple, just type the keywords you want to track for your domain and SEMRUSH will do the rest. You can even compare your domain with other domains for the particular keywords and see where you stand. A good way to start tracking your keywords is to view your ‘Performance’ report from Google Search Console (formerly known as Google Webmaster Tools). Export the keywords from the report and add them to Position tracking to track your progress over time. On page SEO is these days more important than ever. Things like titles and descriptions, alt tags, h1 headings, website speed, duplicate content, broken links are settings you need to get right if you want to increase your website’s exposure in search. 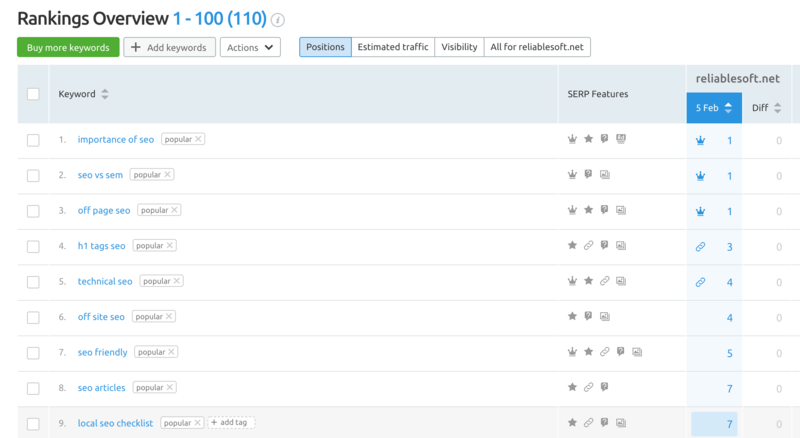 SEMRUSH has a tool called, ‘Site Audit’ (found under ‘Tools’ in the left menu) that will help you fix your on-page SEO. 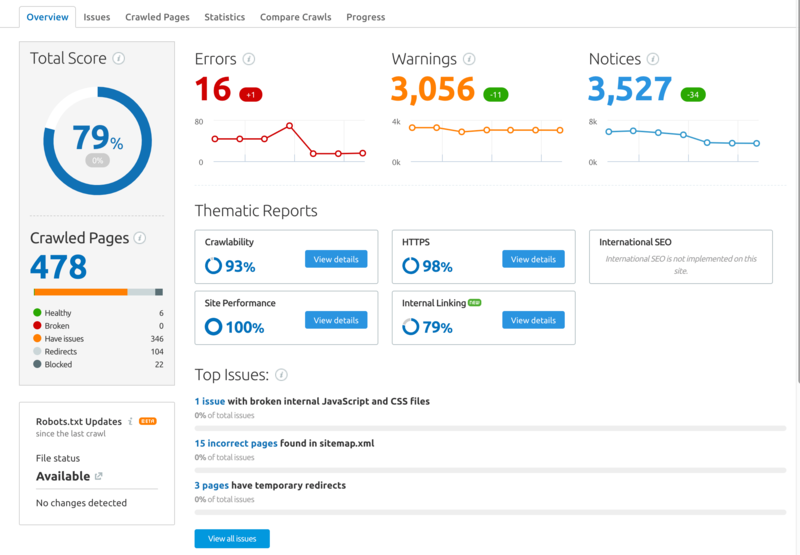 Once you register your website with the Site Audit you will get a report with the errors and warnings you have to fix. Once you make all necessary fixes you can re-crawl your website, get comparisons for the different runs and work until all errors and warnings are gone. I work with PPC a lot, I am an Adwords Certified Professional and my company is a Google Adwords Partner. PPC setup, optimization and management is part of our day-to-day activities. Before starting a new PPC campaign, one of the things you need to do is check the keywords you will be targeting in your campaign and find out as many details as you can about the competition. Who is bidding for those keywords, how much do they spend per day, how do their ads look like, are only a few questions you need to answer if you want to setup a profitable PPC campaign for your business or client. SEMRUSH has all the answers you need. 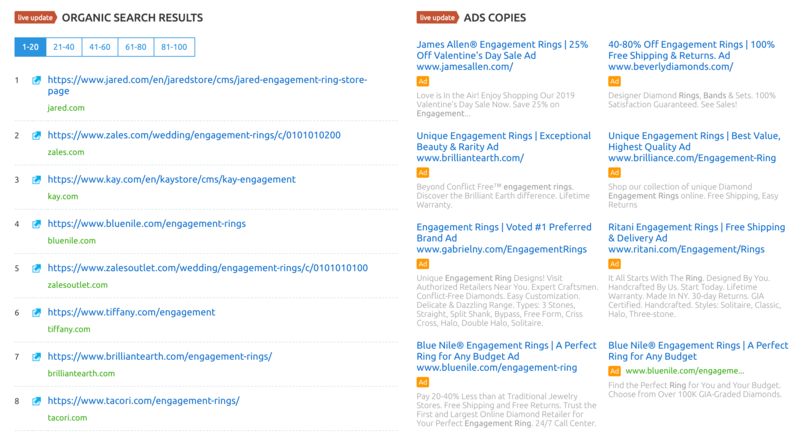 Let’s say that you are preparing a new PPC campaign for one of the most difficult (but also profitable keywords on the Internet), ‘engagement rings’. You can use the ‘Advertising Research’ tool and get all the details you need including: live data, who is advertising for the keyword, average CPC, ad copies (including Google Shopping Campaigns), related keywords and much more. If you are doing PPC then you know how important this information is for you especially when you can drill down, see historical statistics or even export the data to a spreadsheet for further analysis. The PPC functionality was actually the reason I started using SEMRUSH in the first place and then I realised that I can stop paying for other tools and utilize the keywords research, backlink analysis and position tracking and pay less per month. In the article, there are links that point to SEMRUSH. If you click on any of the links and register, I may be entitled to a commission. This does not increase the price you pay to register. What I demonstrated above are just a few ways SEMRUSH can be used by Digital Marketers to make their live easier and perhaps more interesting by revealing data that otherwise is too difficult to find. The tool has many more functions and the good news is that it is constantly enriched with more features (at no extra cost). The company is making an effort to stay on top of their field and maintain their position as one of the best search engine marketing tools in the market. I am using SEMRush for many years and I have sticked to it because it works. I have used other tools in the past and none of them gives you the features of SEMRUSH at this price. I am a happy user and that’s the reason I am sharing my experience. Hope you found this review useful and worth reading. If you are using SEMRUSH (or used in the past), what is your opinion? I learned how to write reviews about tools. 🙂 Thanks for informative post. Just One question to you, Can i use SEmrush for any other language ? How do we hire you for marketing? Finally now a good tool.. You explained the tool in a perfect way. Very Useful Information. Thanks for sharing. .
Hope you enjoy using the tool as much as I do. Excellent review of a great tool. How much do you rely on the search volume data and does it influence your choices of long tail keywords? Search volume data it’s just an indication (on any tool not just semrush). As long as a keyword has some traffic, then it’s good for me. Thanks for sharing this informative post on Semrush. I have been reading a lot about Semrush in recent times. I had even taken the free trial of the same. Semrush looks to be a powerful tool for digital marketing professionals. The features are awesome with the given pricing. Surely need to try out the paid version of the same.